You don't see this every day. It’s not often you see a car wedged into the roof of a house, so this footage from Taizhou, China, is worth a couple of a minutes of your time. As you’ll see, the driver of the Honda CR-V is completely out of control, driving down the wrong side of the road. Seconds later and his clipped the edge of the tarmac and careered into the roof of a roadside house. The unfortunate homeowner with a Honda stuck in his roof said of the incident: “With a big bang, I saw a car stuck in the roof.” Not your ideal start to the day. Eventually, the heavy-footed driver was able to free himself from the crossover using a wooden ladder to get down onto ground. He was quickly lead away by the police for questioning, while his car was craned back onto the road, but not before answering reporters’ questions. “Speed was 70 km/h at that time. A tricycle appeared all of a sudden and I turned north only to find that a car was coming in my direction. I stepped on the accelerator accidentally and changed my direction.” The rest, as they say, is history. 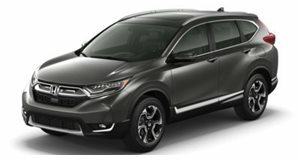 Honda has crafted a very fine family SUV with its latest CR-V.